On 24 September 2018, the U.S. Secretary of Commerce imposed new tariffs on 200 billion dollars worth of Chinese goods, thus widely escalating the “trade war” initiated by president Donald Trump against China in April 2018. Beijing immediately retaliated with tariffs on 60 billions worth of American goods (Will Martin, “China Hits Back at Trump with Tariffs on $60 Billion of US Goods”, Business Insider, 18 September, 2018). Some analysts and commentators are worried that the new tariffs could backfire and may impact the prices of consumption goods on the domestic market, and thus the U.S. consumer (Scott Lincicone, “Here are 202 Companies Hurt by Trump’s Tariffs”, Reason.com, September 14, 2018). However, these analyses do not take into account the “unseen” but intensifying stress that climate change is exercising on the current geo-economic conditions and how its impacts combine nationally and globally with the way the U.S.-China Trade war unfolds and triggers unintended consequences. Indeed, this economically focused view comfortably forgets the consequences of the current planetary change that (not so) silently and invisibly pummels and hammers the industrial, agricultural, trade, finance and monetary actors of the U.S. economy. What must be understood is how conventional economic tensions are now combining in direct and indirect ways with the “long emergency” induced by climate change and the race to adaptation that it triggers and drives (James Howard Kunstler, The Long emergency, surviving the converging catastrophes of the twenty-first century, 2005). In this regard, we are going to study how the 2018 US soybean production adapts to the combination of the current long drought and of the U.S.-China trade war, while the geo-economic and geophysical context are interacting. As we shall show in this article through the case study of the U.S. soybean production in 2018, these tensions on the trade market and their repercussions on the global and U.S. economy, finances and money, are only a part of the risk and uncertainties that looms on the US economy as a whole. It must be noted that these new tariffs have been put in effect while North Carolina was struggling with a gigantic system of floods that ravaged the state, resulting from Hurricane Florence, and while no end seems in sight for the drought that is impacting the South West and the Midwest (Jean-Michel Valantin, “Of Fire and Storm – Climate Change, The “Unseen” Risk to U.S Economy- State of Play“, The Red (Team) Analysis Society, September 17, 2018). In other words, the U.S. economy is now challenged by the way it manages its relationship with its Chinese main customer and national debt owner, while having to adapt to the rapidly changing national and international weather patterns. It must now be understood in which ways the US-China trade war and climate change are reinforcing each other through the weakening and erosion of the most vital basis of the U.S. economy. The U.S.- China trade war versus U.S. Agriculture interests? The trade war started by the U.S. Government against Chinese imports takes place in the context of rapidly changing planetary geophysical and biological parameters (Global change-international geosphere-Biosphere programme). The U.S. executive branch willed and this new trade policy, launched in April 2018, to restore the trade balance between the U.S. and China (Topic “US China Trade war”, The South China Morning Post). As it happens, some consequences of climate change, as the long and sustainable drought that hammers half the United States, and the trade war, are already combining. This can be observed through the case of the soybean production. Soybean has become an essential component for high protein animal feed for poultry, hogs and other livestock. It is also used to produce cooking oil and biofuels. The U.S. produces one-third of the soybean global production (“USDA Supply and Demand Review, Soybeans”, CME Group, 12 September 2018). In 2017-2018, it produced more than 119.5 million metric tons of soybeans. However, it is closely followed by the very competitive Brazilian production with 119 million metric tons (CME, ibid). In March 2018, the U.S. Government imposed new tariffs on 50 to 60 billions worth of Chinese goods. In April, Beijing retaliated by raising tariffs on 128 US goods, worth the same amount, including pork and a 25% raise on soybeans. China is the main importer of U.S. soybeans, accounting for 57% of U.S. soybeans exports (CME, ibid). Meanwhile, since June 2018, Brazilian exports of soybeans went from 6.6 million tons in 2017 to 8.8 million tons in 2018, an increase of 33,33%. This could outline important risks and uncertainty for the U.S. soybean producers, as well as opportunities. The “freed” soybean export capability helps other countries, such as Brazil, to import U.S. soybean, while selling their own crop on the Chinese market (Keegan Elmer, “Soybean giant Brazil swoops on US crop as China trade war punctures prices, ”, South China Morning Post, 20 July 2018 and Brian Wittal, “A second chance for good grain prices? Changes in world markets may give us another chance to lock in high prices, Grainews, September 13, 2018). In the same time, the 2018 global soybean production is being put under pressure by severe droughts in the U.S., South America, Russia and Europe (Lin Tan, “South America Calling, Drought severely stresses Argentina corn, soybeans”, The Progressive Farmer, 3/2/2018). In the U.S, the 2018 drought is the latest occurrence of the multiplication and intensification of multiyear and continent-wide drought systems that affect the US since the end of the 1990s. For example, the long drought of the summer 2012 affected more than 80% of the U.S. agricultural land. If the impacts of that drought were less severe than expected, they were nonetheless felt on livestock food prices during the last quarter of 2012, as well as through slight but widely distributed rises in prices for different kinds of agricultural products (cereals, dairy, poultry, fruits) on the U.S. and international markets (USDA: U.S Drought 2012, Farm and Food Impacts, July 26, 2013). These difficulties go hand in hand with new structural difficulties due to the long drought that impacts the Midwest, from the Great Plains to California, and the return of “dust bowls”, stemming from the aridity of soils created by the lack of rain water and hotter conditions (Scientific American, Melissa Gaskill, Climate Change Threatens Long Term Sustainability of Great plains, Nov 17, 2012). During the 1930s, the era of the Great Depression, dust bowls disrupted the whole farming system and the network of rural and agricultural communities (The Center for a New American Security, Katherine Kidder, GAO: Climate Change Puts U.S Agriculture at High Risk, May 3, 2013). The return of a “dust bowlification” forces farmers to increase irrigation, and thus to intensify pressure on already overused aquifers (Blain and Kytle, The Dust Bowl Returns, The New-York Times, 10 Feb 2014). Complex water stress is also emerging as a disruptive issue because of the convergence of different kinds of competition over this crucial resource. First, we may have rivalry between States, for example those sharing the Colorado River (Fred Pearce, When the Rivers Run Dry, 2006). Then again, water competition in a time of drought also takes place between cities and rural areas, between industry and field cultures, not forgetting the individual uses of water (from sanitary uses to lawn sprinkling and home swimming pools), especially in the Southwest (Earth Future, the American geophysical association, Modeling US Water resources under Climate Change, 2013). In January 2014, California was only at 12% of its snowpack, while the Pacific Northwest was only at 50% (NYT, Porter Fox, The End of Snow?, Feb.7, 2014). If droughts are a recurrent feature of the U.S. climate history, their intensification and combination with the loss of snow packs, diminished stream flows, loss of topsoil moisture, vegetation dryness, and lack of precipitation in the context of shifting climate parameters, is congruent with the effects of climate change. Such phenomena can notably be seen as starting in the 2000s, and more particularly since 2010, with, among others, the 2010-1013 U.S. southeast and Mexico drought, the 2012-2015 American drought, which was an extension of the 2010-2013 situation to the Northern U.S., and the dramatic 2011-2017 California drought (Droughts in the United States, Wikipedia and Peter Folger, “Drought in the United States, Causes and Current Understanding”, Congressional Research Service, 2017). These droughts and numerous heat waves, which happen during those long dry spells, are putting the U.S. agriculture under pressure. Related added costs rise for the farmers: water must be brought to the cattle and the fields, while productivity of certain fields and types of crops decreases, because of the desiccation of topsoil moisture, pests migration, and plant fatigue (Folger, ibid). In the case of soybeans there are very important variables at play from one region to another, in terms of water-holding capacity of soils, and in terms of water, technical and financial capabilities of the farmers to stock up reserves of water, as well as in terms of the categories of seeds they can buy. Thus, thanks to the experience accumulated these last years while facing droughts, especially after the hard 2012 drought, soybean producers are, for the time being, able to adapt to more and more hazardous weather patterns and to produce a record 2018 crop (Steven Wallander, Elizabeth Marshall, and Marcel Aillery, “Farmers Employ Strategies To Reduce Risk of Drought Damages”, U.S Department of Agriculture, June 5, 2017). However, this record production veils important regional discrepancies in terms of adaptation and response to the drought. For example, the crops in central Iowa have been very good, while, the drought-stricken southeast of the state has seen diminishing crop results due to the heat and lack of water (Orrin Shawl, “Despite southeast Iowa drought, Crops in Jasper County ‘relatively’ on schedule », Newton Daily News, August 21, 2018). In the meantime, the soybean of Argentina, the third largest producer of soybean, is in a state of crisis, as a major drought hits. The 2018 crop should represent 75% of the 2017 crop (Tom Polansek, Michael Hirtzer, Maximiliano Rizzi, “Argentina drought bakes crops, sparks grain price rally”, Reuters, March 5, 2018). The drought forced Argentina’s crop processors to buy U.S. reserves of soybeans, thus triggering a hike in prices (CME, ibid). Thus, the new market space opened by the Argentinian drought allows U.S. producers to export their production, hence to absorb the first shock of the U.S.-China trade war, thanks to multi-decade record droughts, while Brazil raises its exports in China (Stratfor contributor, “Why China is Hungry for Brazil Soy”, Forbes, April 10, 2018). Meanwhile, Brazil has also bought U.S. soybean production for its inner market, while exporting on the Chinese market. In other words, the combination of its climate robustness, of the Argentinian drought and of the Brazilian exports towards China are key drivers of the 2018 U..S soybean production prices resiliency in a context of national and international drought and international trade war. Climate change and the U.S.-China trade war: towards a new landscape of climate and geo-economic variables? As we have seen, the multiplication of droughts has become a driver for adaptation for soybean producers and, as such, is becoming a competitive advantage, at least as long as the succession of droughts and other extreme weather events does not exceed the adaptive capabilities and resiliency potential of soybean producers. 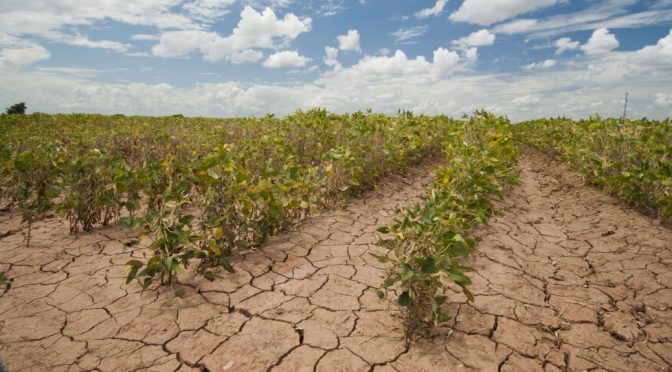 The financial systems that support the U.S. agricultural system are making adaptation possible, giving U.S. producers a competitive advantage on other drought-sensitive countries in a time of climate change, such as Argentina. However, this race to adapt agricultural systems to climate change is now inscribed in the new geo-economic context that is currently emerging from the U.S.-China trade war. If, in the first months of the trade war, the U.S. soybean production demonstrates a real adaptation and resilience capability to this hybridization of geo-economic power plays and worsening climate change, the Argentinian situation shows that agricultural resiliency has serious limits. In other words, understanding the evolution and consequences for economic and political actors of the geo-economic power-plays, such as the current U.S.-China trade war, is necessary in the context of the current planetary crisis and its different expressions, such as climate change. Thus, we shall see with the third article of this series how economic actors can adapt to the coupling of geo-economic tensions and developing climate chaos.